This is mostly a crust of wooden railings bounding the long drives of old estate properties, but it will just as easily colonise wooden bollards in towns and picnic tables set out on grassy lawns by the sea. The green or blue-green thallus is composed of flattened, granular areoles linking together like a jigsaw to form a continuous crust. 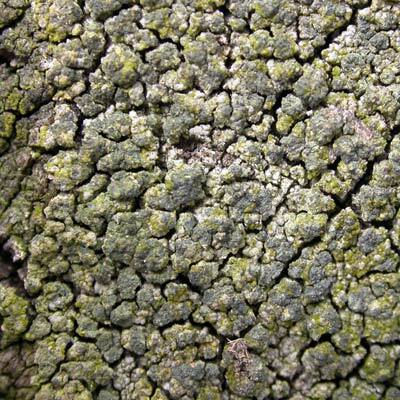 Powdery grey-green to dark blue-green soredia is often present on the surface. A dab of fresh bleach turns it red. Northern half of Ireland, mostly. Simms, M. J., (2016). Trapeliopsis flexuosa (Fr.) Coppins & P.James. [In] LichenIreland.